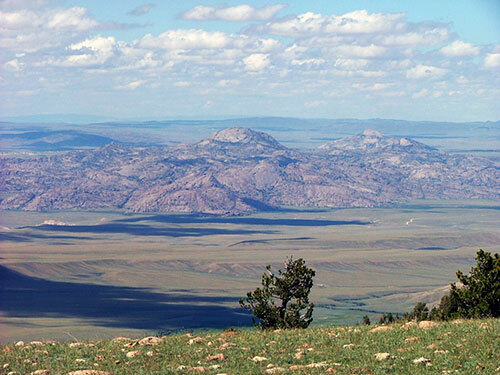 Granite Mountains, Natrona County, Wyoming. The pioneers endured a difficult route getting to the landmark. The trail was marked by high desert climate, with over 1,000 feet of elevation climb, and scarce fresh water sources for themselves or their livestock. A particularly difficult trail segment was between Willow Springs (the first fresh water since leaving the North Platte) to the top of Prospect Hill (aka Ryan’s Hill). The emigrants climbed 400 feet elevation in about one mile. 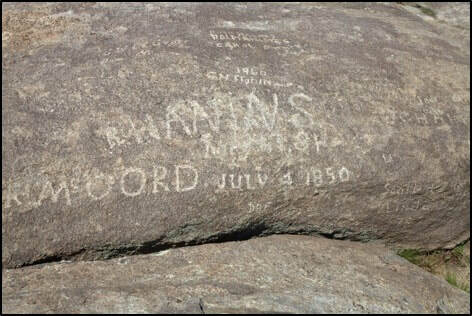 Native Americans saw the continuous stream of people and wagons and called the trail through the Granite Mountains area the “Great Medicine Road of the Whites” (De Smet, 1851). The Granite Mountains are a window into the late Paleocene past when the Rocky Mountains were buried in their own debris. Only the tops of the highest peaks were exposed above the fill. 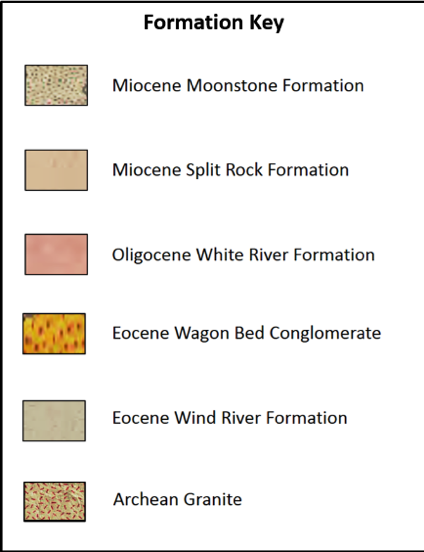 Reconstruction of Wyoming topography during late Miocene time. 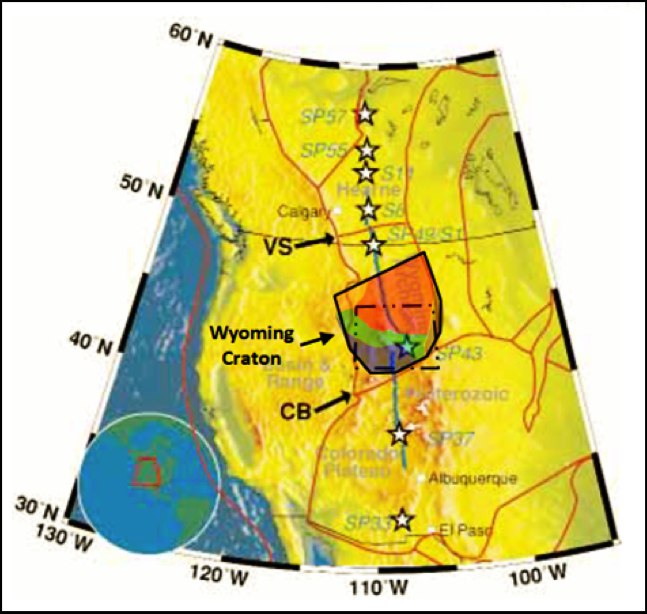 The mountains were almost completely buried and major volcanic centers in the Absaroka-Yellowstone area and the Leucite Hills. 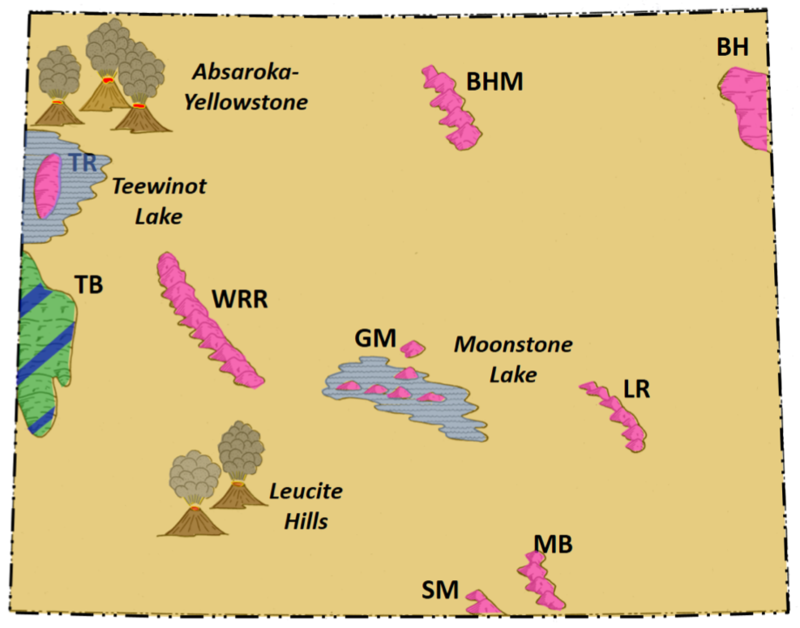 Miocene lakes in the Granite Mountains and the Teton Range. BH; Black Hills, BHM: Bighorn Mountains, GM: Granite Mountains, LR: Laramie Range, MB: Medicine Bow Mountains, SM: Sierra Madre, TR: Teton Rang, WRR: Wind River Range. Image: After Houston, R.S., 1969, Aspects of the Geologic History of Wyoming Related to the Formation of Uranium Deposits: Contributions to Geology, Vol. 8, No. 2, pt. 1, Fig. 6, p. 74. Regional uplift and exhumation of the Rocky Mountains began about 5-10 million years ago. 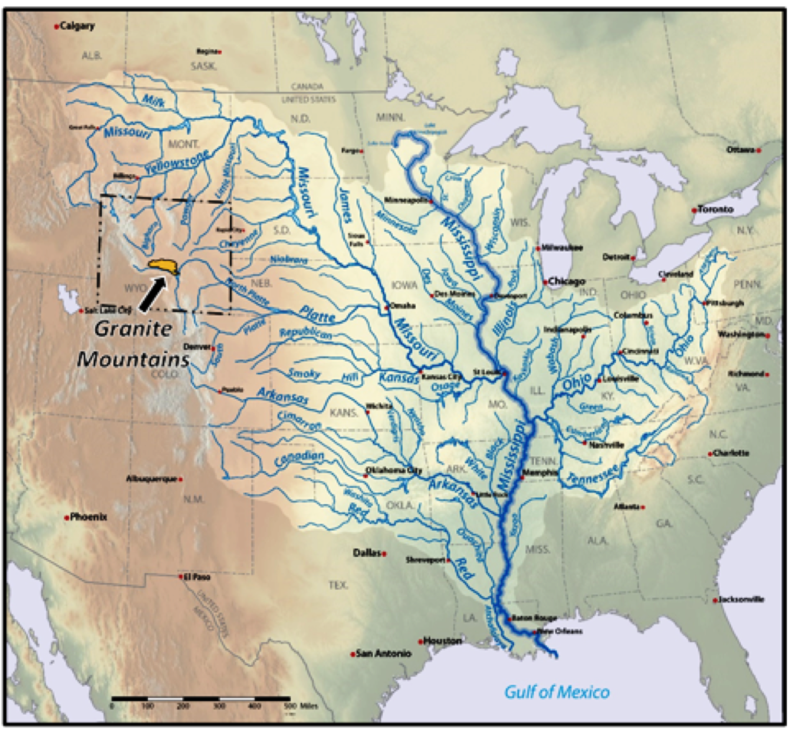 Streams of the Missouri drainage system carried Phanerozoic sediments to the Mississippi River to eventually be deposited in the Gulf of Mexico. Oligocene and Miocene sediments are preserved onlapping onto the Granite Mountains because the collapse of the structural arch about six million years ago protected them from erosion. Mississippi River basin system that eroded sediment from the Rocky Mountains. Location of the Granite Mountains is shown. Generalized map of northern and central Rocky Mountain foreland with preserved Miocene fill shown in gold. Image: After Sales, J.K., 1983, Collapse of Rocky Mountain Basement Uplifts: Rocky Mtn. Assoc. Geologists Field Conference Guidebook, Fig. 1, p. 80. 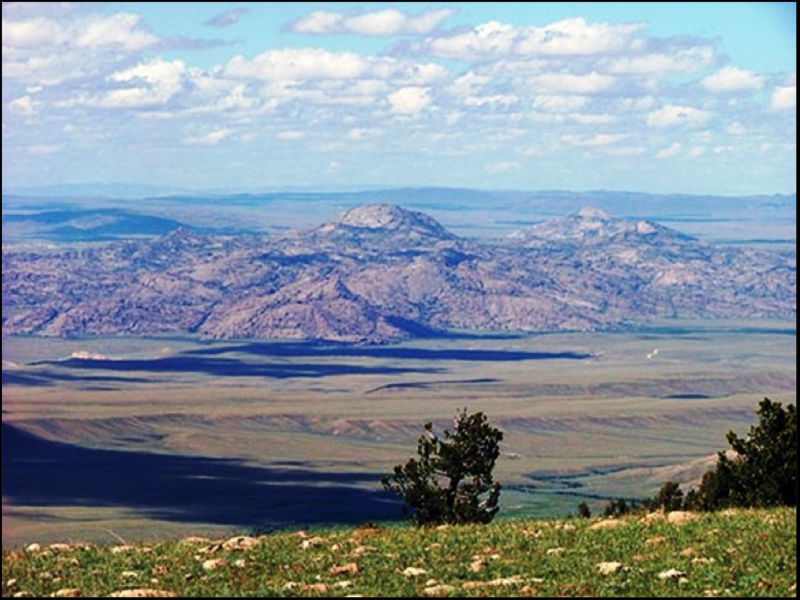 The Granite Mountains are in the Archean-age Sweetwater subprovince of the Wyoming Craton. The subprovince has an east-west tectonic grain reflecting the Archean (> 2.5 billion years) assembly of the subprovince. 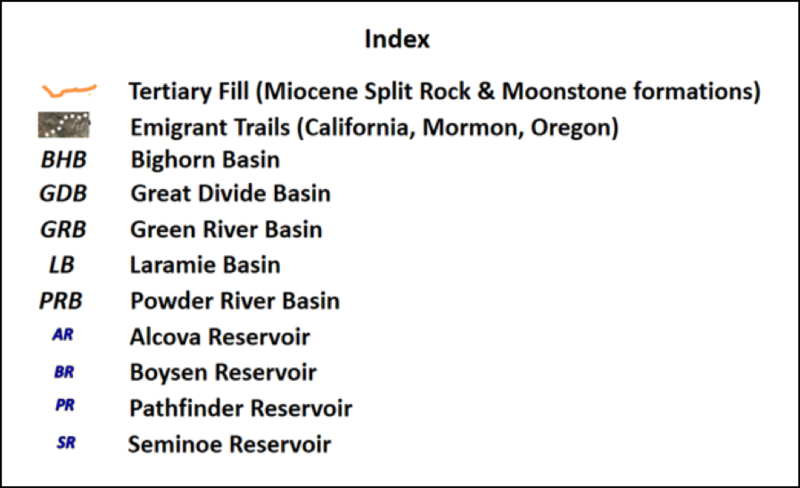 The Oregon Trail structural belt marks a shear zone between the Sweetwater and Southern Accredited Terrane subprovinces. It also marks the southern limit of thick underplating of the Archean crust of the older, northern portion of the craton. The thick crust acted as a rigid buttress for the tectonic accretion of the southern portion of the craton. Wyoming Craton subprovince structure map. Showing the pronounced east-west structural grain established in the Archean. Deep Probe refraction survey Southern Alberta to New Mexico index map. 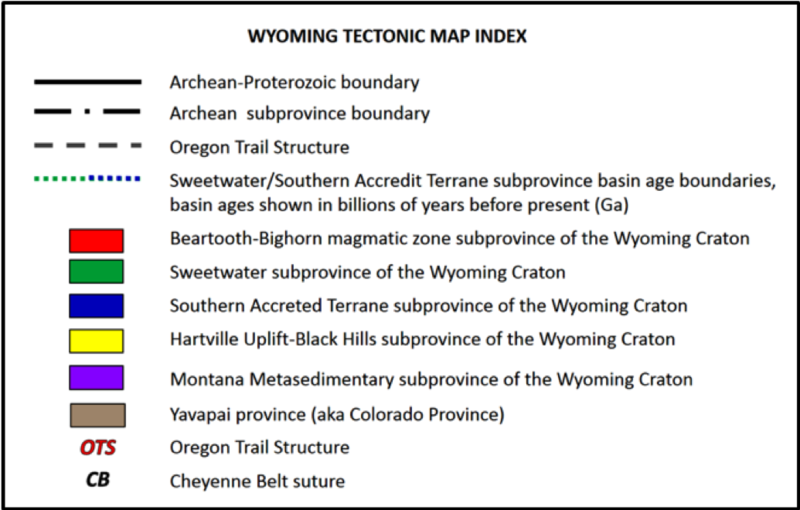 Subprovinces of Wyoming Craton shown. VS: Vulcan Shear, CB: Cheyenne Belt. Image: After Henstock, T.J, Levander, A., Snelson, C.M., Keller, G.R., Miller, K.C., Harder, S. H., Gorman, A.R., Clowes, R.M., Burianyk, M.J.A., Humphreys, E.D., 1998, Probing the Archean and Proterozoic Lithosphere of Western North America: GSA Today, Vol.8, no. 7, Fig. 1 p. 1 and Fig. 3, p. 15-16. The mountains are a structural arch elevated by the Emigrant Trail thrust fault during Laramide mountain building which was triggered by flat plate subduction beneath western North America. The Eocene Epoch (56-34 million years ago) was the time of maximum uplift for the Granite Mountains. The Emigrant Trail thrust movement was directed to the west and southwest, offsetting the basement as much as 24,000 feet. Movement on the South Granite Mountain fault in the late Eocene further elevated the arch. The resulting asymmetric arch was 90 miles long and 30 miles wide, with a maximum elevation of 15,000-feet. The pre-collapse mountains must have looked very much like a twin of the modern Wind River Range. Southwest view of the Wind River Range. The range is oriented NW-SE, 100 long and 30 miles wide. The highest elevation is Gannett Peak at 13,804’. Six million years ago, down-to-the-south movement occurred on the North Granite Mountains fault. Maximum displacement was 800 feet. About the same time, the South Granite Mountains fault down dropped to the north with a maximum displacement of 2,000 feet. The combined motion on the faults collapsed the granite core of the mountains into a graben. The Sweetwater River was trapped in this east-west valley with a much lower base level. It was now unable to erode and carry the Tertiary sediment out of the valley. Southwest to northeast structural diagram of the Granite Mountains graben, showing the collapsed core of the arch and preserved fill. The Greenstone Belt marks the location of one of the Sweetwater subprovince basin margins (Wyoming Craton subprovince structure map, shown above). 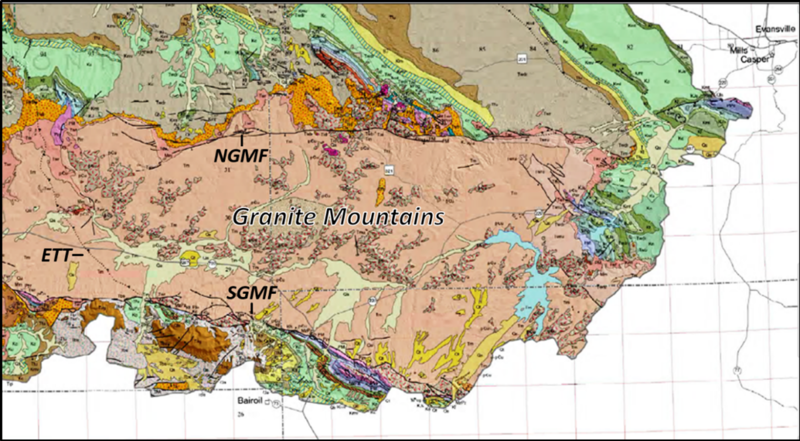 ETT: Emigrant Trail thrust, SGMF: South Granite Mountains fault, NGMF: North Granite Mountains fault. 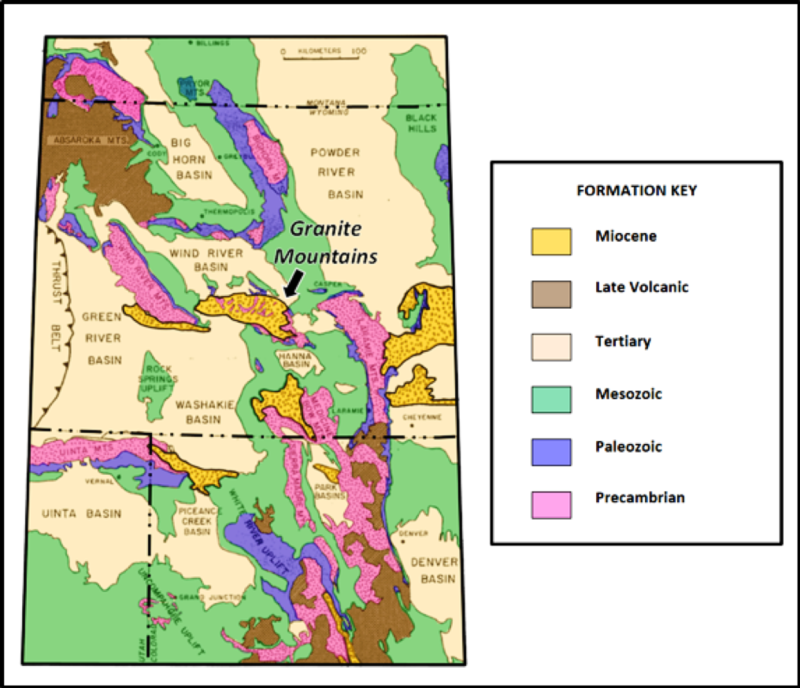 Color code (oldest to youngest): Purple: Greenstone Belt, Pink: Precambrian, Blue: Paleozoic, Green: Mesozoic Tan: Tertiary, Red: Tertiary Intrusion. Image: After Mears, B, Jr, Eckerle, WP, Gilmer, DR, Gubbels, TL, Huckleberry, GA, Marriott, HJ, Schmidt, KJ and Yose, LA, 1986, A geologic tour of Wyoming from Laramie to Lander, Jackson and Rock Springs. Geological Survey of Wyoming Public Information Cirucular No. 27. Laramie, WY. The collapse of the Granite Mountains arch provided native Americans, trappers, settlers, and pony express riders a relatively smooth passage through the Rocky Mountains. 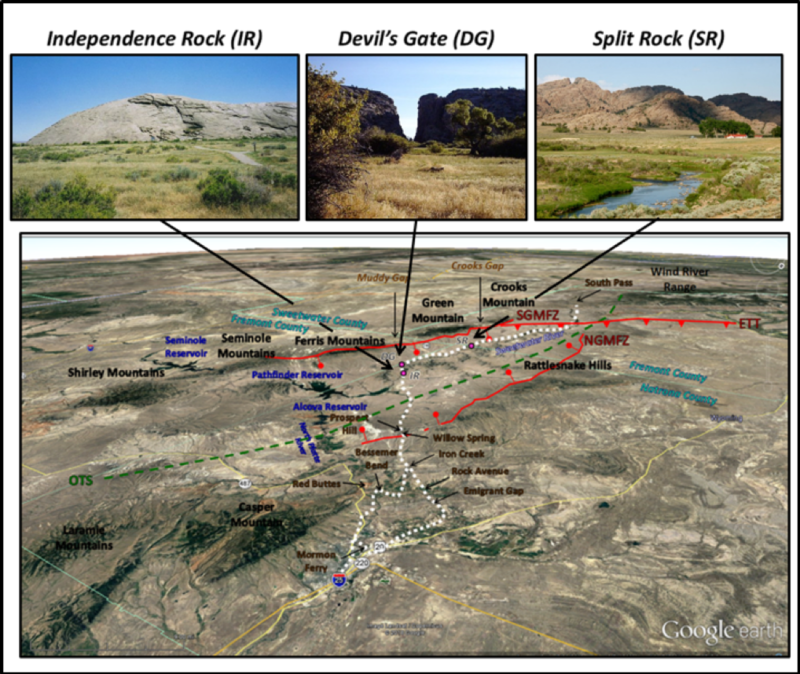 Without this Neogene graben the “Great Medicine Road of the Whites” would never have made history. Southwest aerial view of Emigrant Trail from Casper to South Pass. Iconic granitic knob landmark images of the Granite Mountains shown above. Significant trail markers along the trail are labeled with brown text. 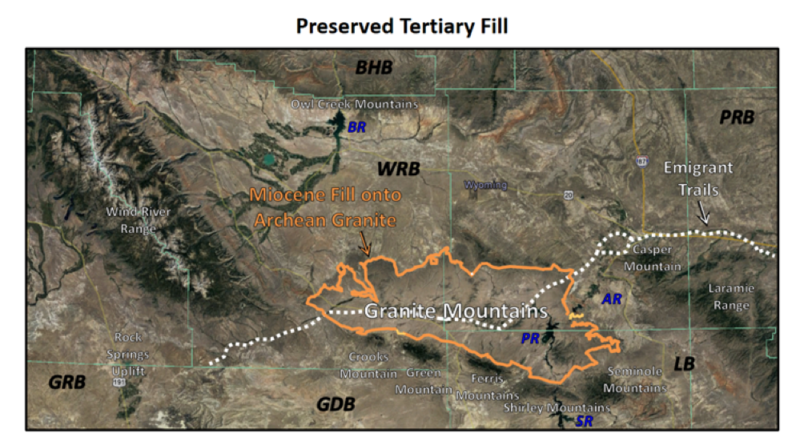 OTS is Oregon Trail Structure, NGMFZ is North Granite Mountain Fault Zone, SGMFZ is South Granite Mountain Fault Zone. Aerial view of Emigrant Trail from Casper to South Pass with Tertiary fill preserved on the collapsed Granite Mountains arch.